Our NEW Accurizing Package of a Savage Rimfire Rifle now includes Re-crowning of the Barrel, a Trigger Job, Lapping the Barrel and Polishing the Chamber, glas-bedding and a 15 - 20 shots firing w/target. ** Please note that we include Barrel Lapping and a 15 - 20 Shot Firing w/target. You may purchase a new thicker bottom iron. 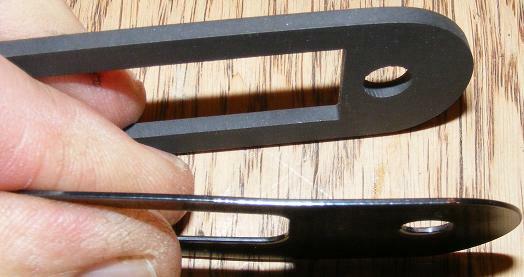 The NEW Bottom Iron we manufacture for the Rimfire Rifle can be purchased for $35.00 + $1.95 s&h. Please specify 22lr or 17hmr and color of blued or SS when you contact us for order. You can email scottsgunsmithing@yahoo.com or call in your order. Payment may be made by credit/debit card, Paypal payment to snull@pdt.net, or mailing a check to S&S Sporting. We typically send these out within 24 hours of receiving payment. I will send a Paypal invoice if requested. We have a NEW One Piece Rail Scope Base manufactured specifically for the Rimfire Rifle which you can purchase alone or in a Ring and Base Package. As you may have seen or heard from your friends and forum members, we have a heavy duty replacement firing pin spring for your rim-fire rifle, to fix that frustrating light strike-misfire issue! Before simply replacing your spring, though, the first thing you must do is determine that your head spacing is correct. You can easily check this yourself. Simply fire a couple of cartridges through your chamber, then find a perfectly flat surface to work on. Stand a new cartridge next to your recently fired one on the flat surface. Check if there is any more of a tendency of the fired cartridges to rock as compared to the new unfired cartridges. The rocking might indicate a head spacing issue. If you have a head space issue it must be addressed, as simply replacing the spring will not completely solve your misfiring problem. With a Rim-Fire Accurizing Package, $225.00 we include head-spacing, or we will adjust head-spacing alone, as well as tune up your bolt for $57.00 (including return shipping). E-mail, or call, to get your rifle in top firing condition. Let us help you with the options to suit your firearms needs.